Have you contemplated being a hairdresser? But quite often though a course would take too long to learn. We specialise in breaking down sections of beauty and hairdressing teaching you the necessary areas for you to start earning money quickly once you have qualified. Hairdressing offers such unique areas of earning a high income, whether that be hair extensions, hair colouring, styling with a variety of high up designs to offer your clients. Income is unlimited with the ability to choose how many hours you want to work each week, how much you earn is down to you, whether you are working within a salon, from home or mobile. Our hairdressing courses cater for students that may be entering this industry for the first time or those who are upskilling/refreshing their existing hairdressing skills. With all the courses we run, you can expect to receive in-depth training from our tutors. All our tutors will be fully trained and experienced within the subject they are teaching as well as being fully qualified Tutors/Assessors. Along with the course subject our tutors will include training on advertising and promoting your business. To ensure our students receive maximum training time, we will supply models for you to carry out your practical training on. This will allow you to gain maximum of experience working on models of varying hair types, lengths, colours etc. This application allows for metal rings with pre-bonded hair to be clamped to the natural hair, creating a thicker and length of hair to suit the client’s needs. You do not need to have any previous experience in hair to be able to offer this treatment to client’s. Hair extensions are a very profitable treatment to offer. Many hair technicians can earn over £1000 per week offering hair extensions. Your training will include how to colour match the hair, the application and removal of hair extensions. You will learn the weave method of hair extension application, this will include the application using micro beads to the natural hair. The celebrity weave is, as the name suggests a favourite with celebrities, this course will train you in how to apply a natural looking hair extension. Colour matching is an important part of the training process, which your tutor will ensure that all students have understood fully. This introductory blow drying course will teach you professional classic blow drying skills. This is ideal for those who struggle with blow drying techniques, if you are a hairdresser and wish to refresh your techniques this is an ideal option for you. You will learn how to create a smooth finish and enhance volume. You will practice your new skills on models allowing you to work on hair of all lengths and textures. One of our most popular courses. Latest trends are for full bouncy curls, a favoured service for those with hair extensions to give them a full and polished result. You will learn how to create a full bouncy blow dry using various methods to achieve a confident and competent result. You will practice on models with a variety of hair lengths and thicknesses to ensure a thorough knowledge on completing your course.. Bridal hair requires skill and confidence to achieve a sophisticated look, whether that be something classical or contemporary, the look has to be stunning. This course will teach you how to achieve a variety of styles, all of which are carried out on models that we supply. Whether you have had previous hair experience or not this course will cater to your skills ensuring that you are confident by the end of the course. 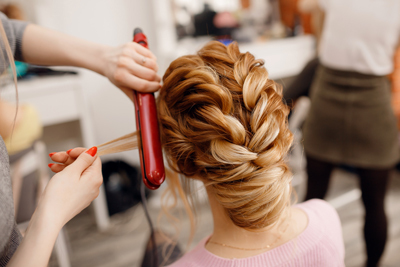 Client’s are expecting hairdressers to cater for all their requirements on a regular basis, with many client’s wanting their hair done not only for special occasions, but for days out, interviews, meetings etc. with this course you will learn a variety of hair up designs. Your training will include creating curls – barrel, loose and tight curls, plaiting, braid, fishtail plaiting, French pleat, beehive, creating a variety of designs on models that will be supplied for you. If you are a complete beginner to colouring or hairdressing this is an ideal starting point for you. The course will teach you the fundamental skills and techniques required to become a confident colourist. Students will be taught how to carry-out an in-depth consultation with the client, through to the various application techniques including highlighting and root colour application. All of which is carried out on models that we supply for you whilst training. BALAYAGE & OMBRE – this course is suitable for those hair colourists who would like to learn the more advanced techniques of colouring. Students will learn how to push their creative skills to create the perfect balayage, advanced colour placement, freehand techniques, learning how to explore the various creative ways of applying fashion colours to create the perfect blend. This course will teach you the basic skills required to achieve professional cutting techniques. You will be introduced to the various tools required for your new skill, your tutor will teach you how to decide which haircut will suit each face shape. You will learn one layer cutting, fringes and a layering technique. Models will be supplied for you to practice your new skills.